From Urban Homesteading to a New Ecology of Housing is a project initiated by the Graduate Program in Design and Urban Ecologies, Parsons the New School for Design, The New School, New York City. —Analyze local policy determinants, programs, finance mechanisms and agencies currently engaged in neighborhood and community stabilization in order to complement and integrate the proposed housing initiatives, while concurrently, interrogating structural dependency in the housing market and the invigorating effect urban state sponsored homesteading activity can exert on the creative and latent productive capacity of homeless, under-housed, foreclosed and displaced people. 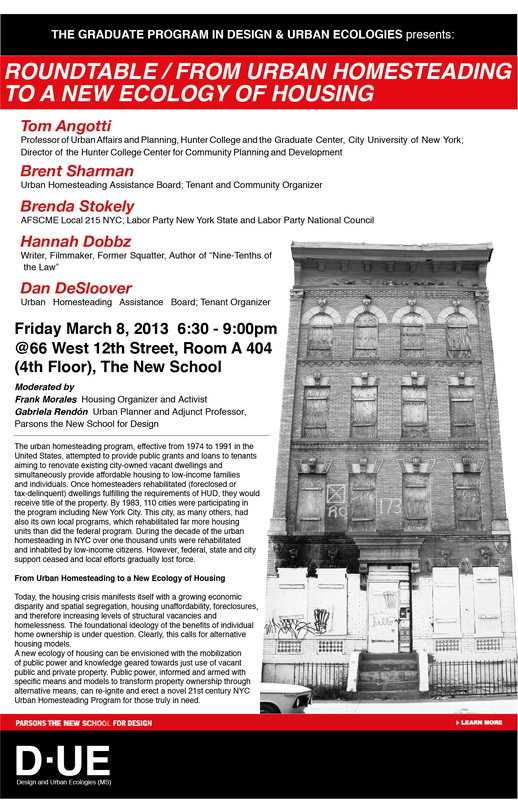 —Design operative strategies, participatory structures, financial tools and legislative avenues for policy application and institutionalization of a new initiative which can provide access to vulnerable and ill-served communities demonstrated in a feasible pilot program in Brooklyn. The urban homesteading program, effective from 1974 to 1991 in the United States, attempted to provide public grants and loans to tenants aiming to renovate existing city-owned vacant dwellings and simultaneously provide affordable housing to low-income families and individuals. Once homesteaders rehabilitated (foreclosed or tax-delinquent) dwelling fulfilling the requirements of HUD, they would receive title of the property. By 1983, 110 cities were participating in the program including New York City. This city, as many others, had also its own local programs, which rehabilitated far more housing units than did the federal program. A number of aspects of urban homesteading seemed to be effective for those advocating housing justice. However, there were also numerous problems with the program’s management, financial mechanisms and its inaccessibility to poor demographics. In addition, one of its main aims was to attract public and private investors to generate money from taxes and to gentrify specific neighborhoods. New homeowners were required to live in the property for only 3 or 5 years, after that period they were free to sell at market value, which some of them did raising the dwellings and neighborhood value. During the decade of the urban homesteading in NYC over one thousand units were rehabilitated and inhabited by low-income citizens. However, federal, state and city support ceased and local efforts gradually lost force. The program responded back then to the alarmed deficit of public housing provision for impoverished households, and the ongoing decline of inner city neighborhoods and communities of color. Today, the housing crisis manifests itself with a growing economic disparity and spatial segregation, housing unaffordability, foreclosures, and therefore increasing levels of structural vacancies and homelessness. In addition, the foundational ideology of the benefits of individual home ownership is under question. Clearly, other housing approaches are called for. Gabriela Rendon is a Mexican-Dutch architect, urban planner and co-founder of Cohabitation Strategies, an international non-profit cooperative for socio-spatial research, design and development based in Rotterdam and New York City. Gabriela’s work combines research and practice at different scales focusing on urban design, strategies and processes counteracting conditions produced by market driven urbanization. Her latest research and work centers on the politics, practices and constrains of socio-spatial restructuring through citizen participation in low income neighbhorhoods in America and Western Europe. Previous research and design include housing and urban rehabilitation in the Northwest Mexican border region. Gabriela is a part-time faculty at Parsons, where she instructs undergraduate and graduate design studios engaging students with local activists and non-profit organizations. She has also taught graduate studios at Delft University of Technology in the Netherlands, where she received a masters in urbanism and is currently carrying on doctoral studies at the Chair of Spatial Planning and Strategy. Frank Morales is an American writer, squatter activist, ordained Episcopal priest (1977) and author of Police State America (Arm the Spirit, 2002) and numerous published articles on housing and social justice matters. Frank worked with the homeless population of NYC back in the late 70s and early 80s, while living in the South Bronx, first as a legal “urban homesteader” and then as a squatter. His experience and work have made him a legend of housing activism in NYC. He has spoken at numerous conferences, lectured at universities and given many interviews on these subjects. Frank has lectured at the New School during the last years and is currently working as a part-time faculty at the Design and Urban Ecologies Graduate Program. A co-founder of Organizing for Occupation in 2010, he has continued to advocate for the acquisition and utilization of vacant housing in the interests of those in need by both permitted and un-permitted means. Frank is currently working on both a memoir and a work of theology for our time.